Send your message: Stand up to the big polluters and protect our water! It’s time for Florida's lawmakers to choose -- protect public interest or protect polluters' interests. Last month, the U.S. Environmental Protection Agency (EPA) and the Florida Department of Environmental Protection (FDEP) announced a backroom deal that hands the regulation of sewage, fertilizer, and animal manure pollution to the state.Now this legislation is headed to the Statehouse. We need to flood our representatives with messages if we're going to drown out the polluter lobbyists and protect Florida’s waterways. Send a message to your state senator and representative urging them to require the state to protect the public interest -- not polluter profits. If this legislation passes, this reckless disregard for our water and health will continue and polluters will be allowed to escape punishment even after a waterbody has been slimed. To add insult to injury, the citizens of Florida will be saddled with the bill for cleaning up our fouled waterways. Enough is enough -- tell your senator and representative to stand with Floridians, not polluters. Right now, polluters are flooding Tallahassee with lobbyists bent on ramming this legislation through and handing regulation over to Rick Scott's Tea Party administration. It is up to us to protect our water, health, economy, and way of life from toxic slime. 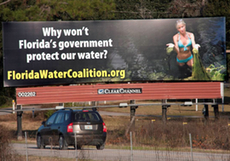 Send your message today to take a stand against the big polluters and safeguard Florida’s waterways. Davis, Jack E. "Column: Lousy Water, louse press for Florida." Tampa Bay Times. 3 April 2013.